Sermons were read during church services and sometimes during the daily prayer services of monks and nuns (the divine office). Collections of sermons were important resources for composing sermons as well as for study and reading from in the divine office. 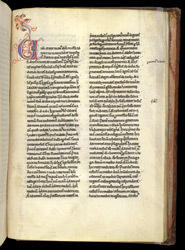 This manuscript containing a collection of sermons belonged to the priory of Rochester cathedral. Drawing upon many authors, the collection emphasises the sermons of Peter Lombard, an important theologian who lived earlier in the 12th century. Many of the sermons in the collection are on excerpts or themes from the Old Testament, suggesting that it was used for reading during the divine office, where Old Testament readings are more varied than those in church services. This sermon is on Ezekiel 2:9 ("Then I looked and I saw a hand stretched out to me"). The short diagonal lines alongside the lines of writing indicate quotations from the Bible (citation marks). Also notes and corrections were written in the margins and between the lines of writing.